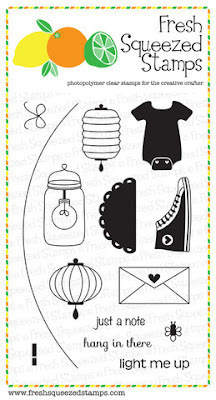 It's Wednesday and my turn to bring you a project from Fresh Squeezed Stamps. Today have a festive birthday card to share with bright summery colours. I stamped the wire and lanterns from String Me Along with Memento Tuxedo Black ink and then colored the lanterns in bright summery colors. I nested together two of the sentiments from Everyday Expressions and stamped them in the bottom corner of my card and finally stamped and coloured two stars from Weather Through around the sentiment, then I used Copic markers to color my images. 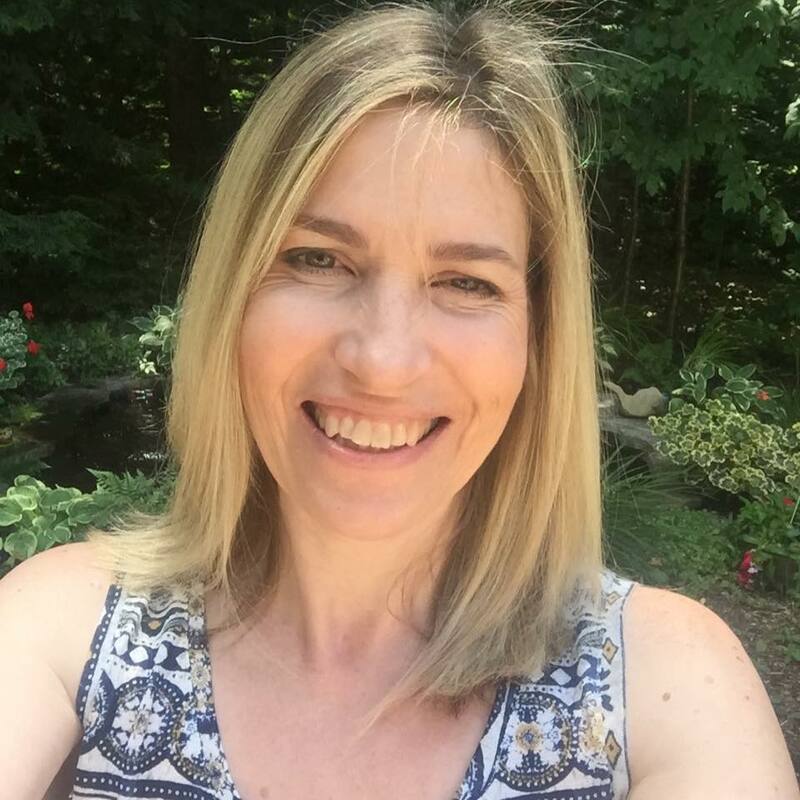 There are so many birthdays in the summertime with my family and friends. Very excited, meeting Ardyth today for lunch. Wish you could all join us! 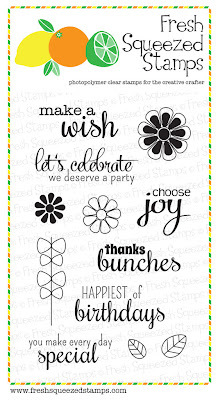 Your card is awesome and those stamp sets look wonderful!! Love those colorful lanterns, Tracey! Fun card! Great pops of colour on this one layer card! I bet you're already in the car on the way to Toronto - can't wait to see you for lunch! What a fun card. I love how you did the lanterns. jealous that I don't have any crafters even remotely close to me! This is so cute and fun. I love how you have strung those lanterns. This card is so fun and happy! I love those brightly colored lanterns. And how fun that you got to have lunch with Ardyth. I bet you had a great time. What a festive card! Love the lanterns and wonderful sentiments! This is just delightful Tracey. The Japanese lanterns are so festive, especially in these bright colors. Fantastic design! Tracey, this is just so fun and festive. I love your hanging lanterns and your coloring is just perfect, bright and vivid. Love it! 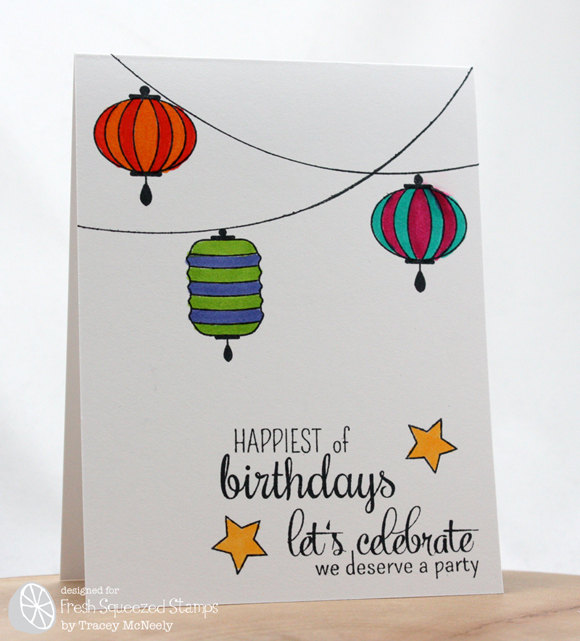 Love the strings of colorful lanterns on this lovely b'cay card Tracey! Great fonts on the sentiments too! Hope you had a lovely lunch with Ardyth! I love how you mixed these stamp sets! 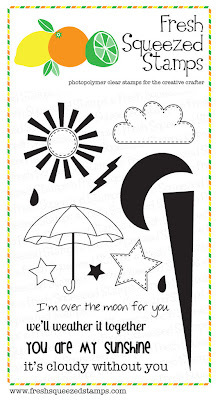 Love the mix of sentiments...such a sweet card! Great mix! Love the card! What a FAB card, Tracey! Love how light and airy it is, and how it's one layer, but still very exciting with the colorful lanterns! Nice pairing of the sentiments too. What a pretty card, Tracey! Love the bright colours on the white backdrop!!! Such a fun card Tracey...Love the vibrancy of it.